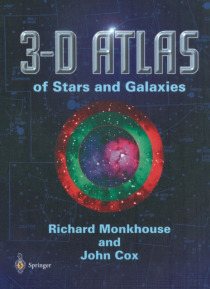 The 3-D Atlas of the Stars and Galaxies shows the stars and A star at twice that distance (and showing a parallax of one-half galaxies in three-dimensional space, with the third of a second of arc) is said to be at a distance of'two parsecs'; one dimension- distance- dire. ctly apparent to stereoscopic showing a parallax of one-tenth of a second of arc is said to be VISion. The 3-D maps- stereogra… phs- are accurate at a distance of ten parsecs, and so on (1 pc "e;"e;,3*26 Iy; 10 pc representations constructed from the most recent data available. ~32*6Iy). Because our eyes are set between two and three inches (50 to 80 The accuracy of measurements of parallax depends in part on mm) apart our stereoscopic vision extends to only a few hundred the apparent brightness of the star to be measured, but yards (metres) at most. We use other visual clues, including our ground-based photographic detection is routinely capable of experience of how large a particular object ought to appear when resolutions to plus or minus eight milliarcseconds observed over a particular range, in order to estimate the distance (8/3,600,000 of a degree). The satellite observatory Hipparcos of things that are further away. We have no direct experience of the made measurements to a precision of plus or minus 0*97 size and the distance of stars, and this is why, looking up into the milliarcseconds.